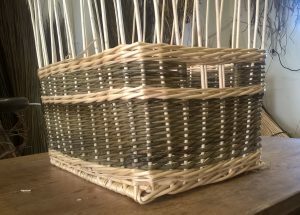 These classes take place in my studio and with only five people in each class so are good for people who really want to know about basketry techniques, skills and materials. As well as being able to see first hand how the materials are prepared there is also a possibility of a trip to our willow growing beds if requested. I also now have a library of basketry books full of ideas and possibilities in my studio for you to peruse during breaks. In the first session you will be getting to grips with the oval base including a chance to try making an underfoot base if desired. These bases will then be used to make at least two oval baskets in subsequent sessions. 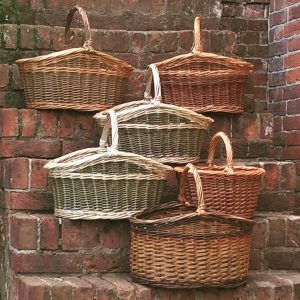 You will have a chance to learn new side weaves and learn about how to shape the basket as you weave. You will also be able to add a handle/handles. Over the three sessions you will learn and then and be able to practise the techniques needed to make square baskets including making the base, scalloming rods to attach to the base and completing a square border. There is also the possibility of incorporating handles into the basket. Cost: £190 for each three day course (Reduced rates for low incomes available). Materials are included.